This is pianist Benjamin Martin’s remarkable debut solo recording with Melba, and follows his two critically acclaimed CDs as an associate artist: Arcadia Lost and Encore My Good Sir. Featured are rarely heard works by British composers far better known for their orchestral compositions: Delius, Vaughan Williams, Bax and Bridge. Also included is the world premiere of Benjamin Martin’s arrangement of Charlie Chaplin’s ‘Smile’ from Modern Times. The liner notes are by two distinguished writers: former Gramophone Editor, Michael Quinn, and Michael Kennedy who writes: ‘Although many fine piano works have been written by British composers, these are still relatively neglected in comparison with other facets of their art. A possible reason for this is that the virtuoso international pianists who have found fame and fortune in their tours of England, have not explored the repertory of their host country. One welcomes the enterprise shown on this disc in a selection of short solo works all of which are characteristic of their composers’ very different styles of approach. Included in Benjamin Martin’s latest Melba release is his arrangement of ‘Smile’ from the movie “Modern Times”, composed by Charlie Chaplin. 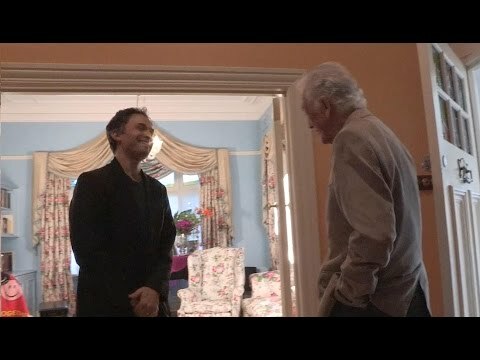 He plays it here for Richard Bonynge, himself an accomplished pianist. Although many fine piano works have been written by British composers, these are still relatively neglected in comparison with other facets of their art. A possible reason for this is that the virtuoso international pianists who have found fame and fortune in their tours of England, have not explored the repertory of their host country. How many of them have played the concertos for the instrument by Ireland, Bliss, Tippett, Bax, Britten, Vaughan Williams, Cyril Scott, or Rawsthorne, to mention only a select few? One welcomes the enterprise shown on this disc in a selection of short solo works all of which are characteristic of their composers’ very different styles of approach. All were written in the decade 1921-30 when the war had been over for five years and more. There was no major work which could be heard as an epilogue to the war years. Not until 1930 was Bliss’s Morning Heroes (containing a setting of words by Wilfred Owen) performed. Vaughan Williams’s Pastoral Symphony was begun while he was serving in France in the front line, but no-one made the connection with wartime until after his death in 1958, obvious though it was once one was let into its secrets and discovered also how much of his music between 1921 and 1958 was wartime in inspiration. Curiously, one of the most direct connections with World War 1 did not appear until 1962, nearly 20 years after the end of World War 2 - Britten’s War Requiem. By 1923, when Delius wrote his Three Preludes, his biggest achievements were behind him. The choral and orchestral masterpieces such as the Mass of Life, the opera A Village Romeo and Juliet, the Song of the High Hills, and the setting of Whitman in Sea-Drift, together with such exquisite nostalgic evocations as On Hearing the First Cuckoo in Spring, Brigg Fair, and Summer Night on the River had established him as the supreme poet of the “Bloom that was once upon the hour”. During the First World War he returned to England from his home in France. He had spent his youth “managing” orange groves in Florida on behalf of his father, an emigré German who had settled in England and was a wealthy wool merchant. Delius senior enjoyed music and was a generous patron but was violently opposed to his son’s ambition to make music his career. But he relented to permit Delius to attend Leipzig Conservatory. The results of dissolute youth in Florida, Paris and elsewhere were the onset of syphilis from about 1922 which eventually caused blindness and paralysis but did not dim his capacity to invent music. To write it on manuscript paper was now impossible and in the last years of his life he was able to compose only because a young English organist, Eric Fenby, volunteered to help him through dictation. The Three Preludes on this disc were pre-Fenby, however, and seem in their lightness of mood to try to recapture the atmosphere of Delius’s youth. There is an easily detectable influence of Grieg, to whose friendship with Delius we owe the Scandinavian element in the Englishman’s music. Whether Delius can be claimed as an “English composer” is arguable, but works like Brigg Fair, First Cuckoo and similar pieces are regarded by many listeners as quintessentially English. The same applies to Elgar and Vaughan Williams, although Germany and France played major roles in the formation of their musical personalities. Likewise Arnold Bax, eventually to be Master of the King’s Musick, eccentric although that appointment seems in retrospect. Born in a London suburb and a student at the Royal Academy of Music, Bax was a brilliant pianist but did not play in public. He is known to have played Strauss’s Ein Heldenleben from sight. Towards the end of 1928, VW promised to write two preludes for her 35th birthday. At the start of 1930 he reported progress: “One is finished, but I think one alone would be a bore to you – the other is only howling in the air. . .” But the second was never written – “it won’t boil”, as he put it. Before the first performance on 14 January 1930 of what was now entitled Hymn Tune Prelude on Song 13 by Orlando Gibbons, Vaughan Williams advised her to play it “not too quick and calm but with sub-conscious emotion”. He had encountered Song 13 while working as music editor of The English Hymnal (1906) for which he adapted it to the words of two hymns. The piano prelude is another example of the magical way in which Vaughan Williams blended the styles of two centuries with out any hint of pastiche. There is nothing in this serene soliloquy to suggest that it was composed in the same decade as the pieces by Bax and Delius. Except, of course, the elegiac tune, but this seems to me to be a response to Gibbons rather than to wartime recollections. Bridge’s sonata (1921-4), belongs unquestionably to the era of its composition. Its opening bars suggest a tranquil vision, but this is shortly swept aside by the music to accompany a nightmare. Bridge was a pacifist and he suffered anguish at the wartime loss of several of his most gifted friends. He was an all-round musician of great talent – viola player, conductor, composer, teacher. The most illustrious of his many pupils was Benjamin Britten, who he took under his wing when Britten was a teenager. They remained friends and Britten became as ardent a pacifist and conscientious objector as his mentor. Much of Bridge’s music in the years before 1924 was richly scored and romantic in mood. His suite The Sea (1910) was a popular success and was followed by Enter Spring in 1927, the work which excited Britten so much when he heard it at a Norfolk Festival. The effect of the war was to make Bridge a more radical composer, interested in Schoenberg and the atonalists. He was also interested in technical matters and instilled his methods into Britten. The Piano Sonata was first played by Myra Hess. After the first violent interruption of the dream-like peace of the opening, the movement follows a pattern of dissonances alternating with the pre-1914 Bridge. As the work progresses, the music becomes more desolate and, although there is lightening of the texture in the middle movement when a new theme occurs, the end is a capitulation to the forces of evil. Britain in the 1920s was a country in steady and seemingly irreversible collapse. Recently emerged from the bloody and exhausting carnage of the First World War and the humiliating loss of Ireland – the first chink in its faltering Empire – it faced the stark reality of a future bleaker than any imagined during even the worst moments of the recent global conflict. With fading memories of the carefree confidence of the Edwardian age extinguished by the unimaginable ­human and economic cost of the long and barbarous war that had been supposed to end all wars, Britain’s immediate prospects felt decidedly less certain and assured. The second decade of the last century saw its once far-flung empire begin to disintegrate, its international influence diminish, its economy tip over into depression, deflation and rising unemployment. 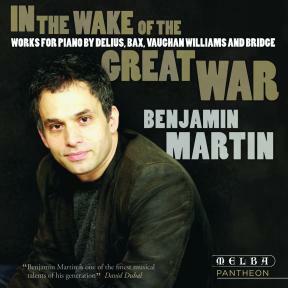 Given such a politically and psychically charged environment, it is tempting to hear the works featured on this disc – all of which were composed in the decade from 1921-30 – as responses to the palpable sense of entropy then enveloping a Britain whose greatness had been robbed by the Great War. The Three Preludes by Frederick Delius provide an apt curtain raiser for the public and private dramas that are to follow. Plaintive, certainly, but in a precisely pretty way, they seem to offer a gentle, sun-dappled echo of a now shattered and lost idyll. That the fleet second prelude carries itself with a Grieg-like inclination towards fantasy only serves to underline their nostalgically inclined distractions. The eldest of the four composers heard here, Delius was already 52 when hostilities began in 1914. Born in Bradford to a German wool merchant-father, at 22 he left England – a country he later claimed to loathe – for the sunnier climes of Florida to manage an orange plantation. Studies in Leipzig followed before he settled in France, returning briefly to England only during the war years. Composed in 1923, the Three Preludes are quixotic, quicksilver miniatures that seem to dance en pointe on filigree-delicate surfaces in constant, liquescent motion. Betraying neither the worsening physical and psychological pain of the syphilis-induced blindness and paralysis that was locking Delius inside a failing body, nor echoes of the war that had so recently torn Europe apart, they belong to an earlier age of innocence and fantasy. The preludes received their first performance at London’s Wigmore Hall in late 1924 with Evlyn Howard-Jones – to whom the first prelude is dedicated and who later recorded all three in 1929. Deceptively simple at first glance, each makes particular and pointed demands of a pianist’s dexterity. The Scherzando is a gently mellifluous succession of ascending arpeggios dotted by melodic accents that threaten to evaporate as soon as they are heard but accrete, instead, into an utterance of majestic chords and octaves before returning to the tranquillity of its beginning. Dedicated to Adine O’Neill, the wife of Delius’s composer-friend Norman O’Neill, the second prelude, marked ‘Quick’, deports itself with contrasting briskness. Sleek, silvery, sinewy melodies vault out of rippling sixteenths like salmon leaping from a fast flowing stream to catch the sun before disappearing beneath the surface again. The sense of liquid motion is captured with exquisite fleetness in the final Con moto prelude where tumbling arpeggios move with the ‘lively, undulating’ free-flowing quality specified by Delius on the score, cascading one into another over a thickening melody until all is resolved in silence and calm. The Great War was not the only conflict in which Britain was involved in the early part of the last century. Ireland’s long struggle to free itself from Anglo-Saxon occupation came to ferment with the Easter Uprising in 1916. For Arnold Bax, already deeply enamoured of Irish folklore and the poetry of WB Yeats – which he later eulogised as ‘meaning more to me than all the music of the centuries’ – revolt in Dublin was more pertinent and profound than anything happening on continental Europe. His Third Piano Sonata dates from 1926, by which time Bax had clearly nailed his Celtic credentials to the mast with the tone poems In the Faëry Hills and The Garden of Fand and the Quintet for Oboe and Strings. By then, too, his long established professional partnership with the pianist Harriet Cohen – 12 years his junior and to whom the sonata is dedicated – had developed into a sexual relationship. Although the affair precipitated a painfully public end to his marriage, the refusal of his wife to grant a divorce, together with the disapproving mores of the time, meant that Bax and Cohen were compelled to conduct themselves with a furtive discretion that lasted until Bax’s death. Composed in three movements between his Second and Third Symphonies, the sonata was first performed by Cohen in Liverpool in November 1927, its London premiere following in January the following year. The compelling immediacy of the live recording featured on this disc (from the glorious acoustic of the Australian National academy of Music’s South Melbourne Town Hall in October 2006) brings to the fore the music’s brooding, emotionally agitated mood, the public dimension serving to emphasize an almost palpably confessional quality in which the most intimate unburdening is expressed in extravagant gestures derived in equal measure from despondency and defiance. In such turmoil and turbulence, the Third Piano Sonata owes something to the First Symphony (1922) but its intentions, its import – for all the explicitness of its working out – seem less clear. The constant restlessness of the piano writing – lent additional gravity by an extensive use of pedal – speaks of personal anguish, of Bax’s emotional and physical need, perhaps, for Cohen whose relationship with Bax would last more than 40 years, or of the poetic and philosophical desire for the purity of a Celtic twilight recently plunged into polluted night by the outbreak of civil war in his beloved Ireland. Potently, it seems to address both. Certainly, the two outer movements testily point to the unresolved tensions of both concerns: the unsettled first moving from tremulousness to tempest and back again; the last, a torrent of notes, scurried along with almost Scriabin-like fervour, that vainly surge and crash against the shore with impotent tidal insistence. The slow, middle movement offers little succour, its lyrical introspection tinged with a bleakness only momentarily diluted by the soft, comforting security of one of Bax’s own ersatz Irish folk tunes before it evaporates forlornly into unresolved fantasy. Alone among the four composers here, Ralph Vaughan Williams was the only one to experience combat during the Great War. Aged 41 in 1914, he enlisted in the Royal Army Medical Corps and served as a stretcher bearer in France and Salonika before being commissioned as a second lieutenant in the Royal Garrison Artillery and sent to the Western Front. The experience of war had a profound effect on his music. What Wilfrid Mellers described as Vaughan Williams’ earlier ‘vision of Albion’ had, to borrow from Yeats, changed and changed utterly. The idyllic innocence that had hitherto characterised his music in works like the Pastoral Symphony and the ballad opera Hugh the Drover, completed on the eve of war in August 1914, had been left behind on the battlefields of Europe. Although dating from late 1929, the Hymn-tune Prelude on Song 13 by Orlando Gibbons has its roots in the Church of England’s invitation to Vaughan Williams a quarter of a century before to co-edit, with the Anglican priest Percy Dearmer, The English Hymnal, ‘a collection of the best hymns in the English language’. As with many pieces by Bax, Harriet Cohen was also a muse for Vaughan Williams, who composed the prelude as a gift to mark the clearly alluring pianist’s 35th birthday. It was presented with the proviso that such generosity required a ‘reward’ of ‘one thousand kisses,’ of which, Vaughan Williams told her, he intended to keep a ‘meticulous’ record of their re-payment. Similarly to the earlier Fantasia on a Theme by Thomas Tallis of 1910, Gibbons is afforded by Vaughan Williams a treatment of comparably translucent sensitivity, albeit noticeably less lush and with a more pronounced and limpid, cut-crystal delicacy. On his score, Vaughan Williams indicated that it should be played ‘not too quick – and calm, with sub-conscious emotion’ and, heard accordingly, it carries itself with a beauty as brittle as it is wistful. ‘Intentional or otherwise, Bridge’s Sonata has a certain programmatic aspect. Without question, the profound impact of human suffering resulting from World War I is apparent throughout; a feverish tossing and turning typical of nightmares pervades much of the work. ‘In the first movement, interrogations and images of bullying drill-sergeants and bullet-riddled bodies alternate hazily with the reassuring tones of a gentle voice ushering someone back to sleep. The second movement evokes memories of a tender romance, or perhaps one dreamt, veiled within a sinister atmosphere. The melody commonly known as Smile was composed by Charlie Chaplin and arranged by Edward Powell and David Raskin for the soundtrack of the 1936 “silent” film Modern Times. It was to see the last outing on screen of Chaplin’s signature creature – the indomitable Tramp character – as he attempts to make sense of and engage with a world that has become uncaring and dangerously brutal. Chaplin’s iconoclastic put-upon everyman is both dazzled and dizzied by the rapacious demands of monolithic technology and trips his innocent way through streets where injustice and poverty lurk around every corner. But through his quintessential human qualities of love and optimism, the Tramp triumphs and emerges undiminished by the seemingly overwhelming forces of life’s injustices. Such was the film’s impact that it is said that the French philosophers Jean-Paul Sartre, Simone de Beauvoir and Maurice Merleau-Ponty named their journal, Les Temps modernes, after it. Smile is one of Chaplin’s greatest love themes, its plaintive prettiness punctuated by the melancholic key of D minor. It is heard as a touching commentary on the Tramp’s efforts to buoy the spirits of his despondent sweetheart. In the movie’s final scene, set at sunrise, the Tramp draws his sweetheart’s eyes to his captivating smile and hand in hand they set off down the road together to an uncertain but optimistic future. With lyrics added in 1954 by John Turner and Geoffrey Parson (who also gave the love them its title) Smile was recorded by Nat King Cole the same year and quickly established itself as a part of the American Songbook. It has since been recorded by a diverse array of artists including Plácido Domingo, Diana Ross, Liberace and Michael Jackson. The Melba Foundation wishes to express its gratitude to Lady Marigold Southey AC whose generous support made this recording possible.